Awarded to an employee who displays exceptional dedication to duty in pursuit of a worthwhile objective, which required courage and is knowingly done with risk of injury. Sergeant Kelly J. Copeland Jr. Agent Phillip A. Martz Jr. Awarded to an employee for courageous, outstanding, or unusual performance of duty that is significantly beyond that normally expected and may be based on a single act or on exemplary work over an extended period of time. 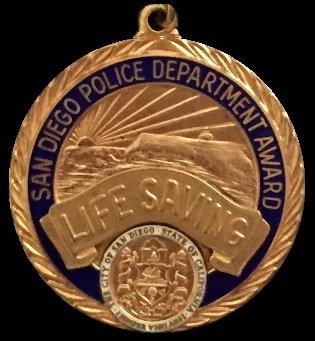 Awarded to an employee who saves a life by direct action, such as mouth-to-mouth resuscitation. No need for the act to be performed under conditions requiring bravery or exposure to danger. Recommendations for this award are usually accompanied by medical or eyewitness testimony. Awarded when an employee, while in the line of duty, sustains a serious wound or great bodily injury inflicted by a hostile person. The Purple Heart may be awarded in conjunction with the Medal for Valor, Meritorious Service Award and Lifesaving Medal. These medals may be awarded posthumously. 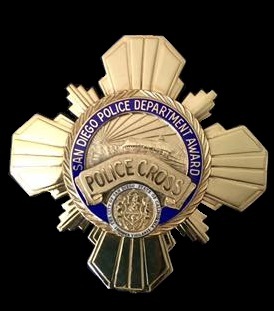 SDPD Medal for Valor recipients are members of the Police Museum Hall of Fame. Click the banner to visit the hall. member at the time of the award/incident. Awarded posthumously to an officer who in the performance of their duty and under honorable circumstances lost their life by a hostile person or during an act of bravery. The Police Cross may be awarded in conjunction with a Medal for Valor, Meritorious Service Award and Lifesaving Medal. Patrolman Edward J. Moore Jr.